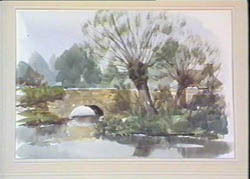 Ron's painting locations range from the Windrush valley in the Cotswolds to the Severn Estuary and Gloucester docks, interspersed with studio demonstrations. His painting style is fast, direct and exciting and the film covers every aspect of watercolour, opening our eyes to a new way of looking at the landscape. 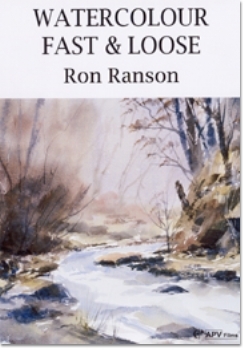 Ron Ranson's Fast and Loose approach with a hake brush is meant to make it look easy and to demystify a process that was never all that mysterious in the first place, thus pointing beginners along the dangerously seductive road to facile success with formula pictures of hills, trees, water, and so on that have the superficial charm of rapid effectiveness. Moreover, the hake brush has a distinctive set of footprints that can lead to a limited vocabulary for making limited statements. At least though, Ron Ranson claims to have helped thousands to loosen up and not be afraid of the paper. 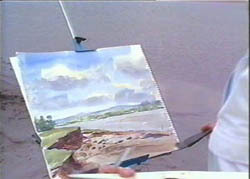 And that is a good first step for those hoping to master the art of watercolour.